After the New York Times revealed that Montana Democratic Sen. John Walsh had plagiarized his master's thesis for the U.S. Army War College, Allen West brought the knives out. "The case of U.S. Senator John Walsh just goes to further demonstrate the Left’s hypocrisy," the former Florida congressman and Tea Party hero wrote in a blog post. "This story should have received more attention, but it’s all about who controls what’s reported. Cadets in our service academies live under a code of honor — I wish our elected officials would as well." It appears that West, a retired Army lieutenant colonel, does not live under that code of honor himself. The watchdog group Media Matters for America reported Friday that West significantly plagiarized from a viral Internet post for a recent column asserting that President Obama has ignored the deaths of police officers amid the national outcry over police killings of unarmed black men in Ferguson, Missouri and Staten Island. West, now head of the National Center for Policy Analysis, a right-wing think tank based in Texas, published the column yesterday. In it, he asked whether Obama and Attorney General Eric Holder "consider if the lives of law enforcement officers matter." The slogan "black lives matter" has become the rallying cry for protesters demonstrating police violence against African Americans. The post drew heavily on a piece that has been circulating on the Internet for months. "The viral piece, which attacks President Obama's response to law enforcement murders, has been posted on various websites, comments sections, message boards, and Facebook pages (including on West's fanpage by one of his followers)," Media Matters' Eric Hananoki writes. Media Matters identified six passages in which West copied the viral piece virtually word for word. Does anyone remember Detective Melvin Santiago? He was a Jersey City police officer who was shot to death on July 13, 2014. Santiago was white. His killer, Lawrence Campbell, was black. Does anyone recall Obama appearing before national television and calling for justice for Officer Santiago's family? Does anyone remember Detective Melvin Santiago? He was a Jersey City police officer who was shot to death on July 13th. Santiago was white. His killer, Lawrence Campbell , was black. Does anyone recall Obama appearing before national television and calling for justice for Officer Santiago's family? Does anyone recall Eric Holder rushing to Jersey City to see that justice was done? Take the case of Officer Jeffrey Westerfield. He was a Gary, Indiana police officer who was shot to death on July 6, 2014. Officer Westerfield was white, his killer, Carl LeEllis Blount, Jr. was black. Anyone recall a statement from President Obama? Did Eric Holder fly over and visit with the family? Officer Perry Renn was an Indianapolis, Indiana police officer who was shot to death July 5, 2014. Officer Renn was white. His killer, Major Davis, was black. And how many White House envoys attended Officer Renn's funeral? Officer Perry Renn was an Indianapolis, Indiana police officer who was shot to death July 5, 2014, the day before Officer Westerfield was killed. Officer Renn was white. His killer, Major Davis, was black. 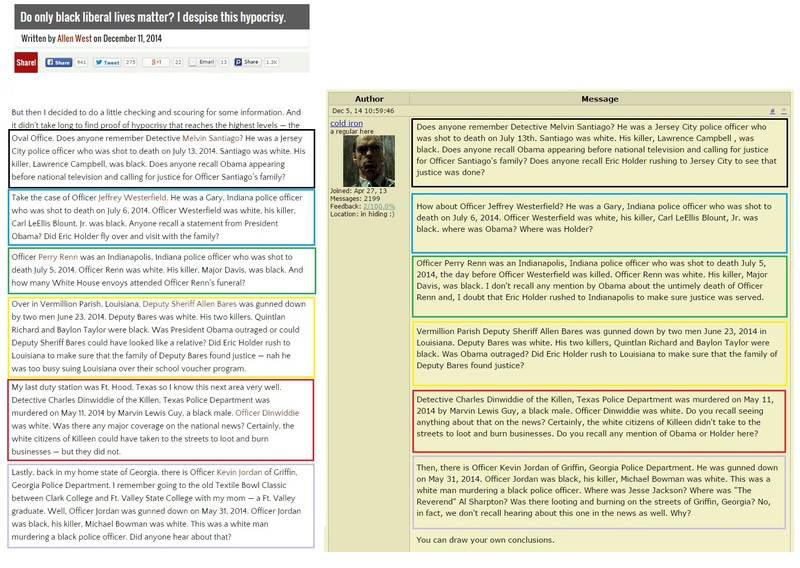 I don't recall any mention by Obama about the untimely death of Officer Renn and, I doubt that Eric Holder rushed to Indianapolis to make sure justice was served. Over in Vermillion Parish, Louisiana, Deputy Sheriff Allen Bares was gunned down by two men June 23, 2014. Deputy Bares was white. His two killers, Quintlan Richard and Baylon Taylor were black. Was President Obama outraged or could Deputy Sheriff Bares could have looked like a relative? Did Eric Holder rush to Louisiana to make sure that the family of Deputy Bares found justice -- nah he was too busy suing Louisiana over their school voucher program. My last duty station was Ft. Hood, Texas so I know this next area very well. Detective Charles Dinwiddie of the Killen, Texas Police Department was murdered on May 11, 2014 by Marvin Lewis Guy, a black male. Officer Dinwiddie was white. Was there any major coverage on the national news? Certainly, the white citizens of Killeen could have taken to the streets to loot and burn businesses -- but they did not. Detective Charles Dinwiddie of the Killen, Texas Police Department was murdered on May 11, 2014 by Marvin Lewis Guy, a black male. Officer Dinwiddie was white. Do you recall seeing anything about that on the news? Certainly, the white citizens of Killeen didn't take to the streets to loot and burn businesses. Do you recall any mention of Obama or Holder here? Lastly, back in my home state of Georgia, there is Officer Kevin Jordan of Griffin, Georgia Police Department. I remember going to the old Textile Bowl Classic between Clark College and Ft. Valley State College with my mom -- a Ft. Valley graduate. Well, Officer Jordan was gunned down on May 31, 2014. Officer Jordan was black, his killer, Michael Bowman was white. This was a white man murdering a black police officer. Did anyone hear about that? Then, there is Officer Kevin Jordan of Griffin, Georgia Police Department. He was gunned down on May 31, 2014. Officer Jordan was black, his killer, Michael Bowman was white. This was a white man murdering a black police officer. Where was Jesse Jackson? Where was "The Reverend" Al Sharpton? Was there looting and burning on the streets of Griffin, Georgia? No, in fact, we don't recall hearing about this one in the news as well. Why? Though West lost his congressional seat after just one term in 2012, he has floated the possibility of a 2016 presidential bid. If he joins the field, he likely won't be the only plagiarist running. Kentucky Sen. Rand Paul, who is widely expected to seek the GOP nod, has significantly plagiarized from other sources in several op-ed columns, speeches, and one of his books. Despite the revelations, however, Paul is still taken seriously as a presidential candidate. But West now leads a think tank billing itself as an ideas-based institution that broadcasts some of the "best scholarly research," so his plagiarism scandal may do more lasting damage. Update, 5:30 p.m. ET: Media Matters reports that West has since altered his column, adding the sentence, "Then I came across a widely circulated email and viral internet post about a number of stories that seem to have dropped off the radar of the mainstream media, and conveniently ignored by the Department of Justice." Originally, West had written, "I decided to do a little checking and scouring for some information. And it didn't take long to find proof of hypocrisy that reaches the highest levels -- the White House." Michele Hickford, editor-in-chief of AllenBWest.com, told Media Matters that "as editor, I had inadvertently omitted the quotes, and once I realized the quotes were omitted, added the sentence regarding the source of the original content to clarify." That statement doesn't explain why West originally suggested that he himself had performed the research for his piece.